Today’s AM fix was USD 1,294.00, EUR 939.86 and GBP 777.78 per ounce. Friday’s AM fix was USD 1,295.75, EUR 944.15 and GBP 779.68 per ounce. This Friday, April 4th at 0900 GMT, Dr Faber will give insights into his strategies for protecting and growing wealth in 2014 and beyond. Register today and don’t miss this opportunity to hear one of the world’s most respected investment experts. Gold climbed $0.20 or 0.02% Friday to $1,292.70/oz. Silver rose $0.04 or 0.2% to $19.79/oz. Gold and silver were both down for the week at 3.02% and 2.46% respectively. Gold is trading close to a 6 week low today and looks set to have its first monthly decline this year. The weakness is being attributed to hopes of a U.S. economic recovery and the recent abatement in geopolitical tension between Russia and the West. Gold bullion is down 3% in March and is almost $100/oz below a six month high reached in March. It has fallen $100 in 10 trading sessions. The U.S. non farm payrolls figure Friday will give another glimpse as to the health of the struggling U.S. economy. Palladium is nearly 1% higher today to $782.50/oz on Russian and South African supply concerns. Among other precious metals, platinum rose nearly 1% today as labour strikes continued in top producer South Africa. In the gilded ballroom of Hyatt’s Savoy Hotel in Melbourne Australia, Dr Mark Faber was the first speaker at the Port Phillip Publishing, World War D conference. Faber delivered an important message, saying that “The old world order is over”. 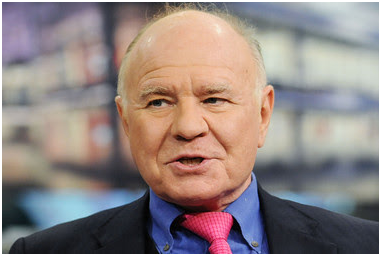 Dr Marc Faber is a respected economist and investment guru who predicted the Wall Street Crash in 1987, the Nasdaq crash, the property bubble and the Eurozone and global debt crisis. He is the editor and publisher of the Gloom, Boom & Doom Report and the author of many books including the best selling ‘Tomorrow’s Gold: Asia’s Age of Discovery’. Faber advised investors to buy gold in 2001 and he is still extremely bullish on gold and silver. He believes that gold will rise in the coming years due to currency debasement. Money Morning Australia reported on Faber’s address to the conference. “The U.S. reached a peak in prosperity and influence in the world in the 1950s or 1960s,” warned Faber. But since the 1970s the superpower has been locked into a cycle of bubbles, busts and growing debt. “There are some people who claim to be economists who will tell you debts do not matter,” Faber said but he told the packed ballroom that the real story is very different. Faber explained the flaw is at the heart of ultra loose monetary policies such as QE. “When you drop dollar bills into the economy…it won’t lift all prices and assets equally at the same time,” he said. In the 1960s and 1970s, extra money flowing through the economy inflated wages; in the early 2000s, money printing inflated tech stocks. Thus, money printing creates more bubbles. Some assets go up, they overshoot, collapse and cause significant damage. This necessitates, in the view of the U.S. Federal Reserve, more money printing. It is a vicious cycle we’ve seen since the 1970s: every time there is an economic problem, the Fed prints money and creates more distortions and bubbles. Bernanke’s tenure saw this trend continue, and when it came to assessing the former Fed chairman, Faber didn’t mince his words. “He’s been a disaster,” Faber warned. Faber pointed out that not only did Bernanke not notice the subprime disaster, he actually denied it existed and even helped create it. “Under his tenure at the Federal Reserve and under his intellectual influence when working for Mr Greenspan, they created the gigantic housing bubble,” Faber said. At the heart of this expansion in debt, and cycle of bubbles and busts is the reliance of the U.S. economy on consumption. For the last century, policy makers have encouraged consumption on all levels of society including government, and discouraged savings. But according to Faber, consumption doesn’t create a strong economy. “Wealth doesn’t come from consumerism, it comes from capital spending,” he said. And the problem for the U.S. economy is that while debt has continued to rise, capital investment hasn’t. In fact, it’s been falling sharply for a long time. “If we have growing debts, there’s a difference in quality of those debts,” he said. Japan, South Korea and Taiwan used their debts to invest in factories, plants…investments that generate wealth. According to Faber however, the U.S. has just acquired debt to fuel consumption. “Where’s the future income?” he asked. “We live in a new word. We live in a world where the balance of power has shifted to emerging countries,” said Faber. One of the most important emerging economies is China. While China’s growth story is well known, Faber gave the audience an important geopolitical sub story. China’s massive growth triggered massive commodity export booms in emerging economies. China’s real success was exporting the products it produced back to emerging economies. This has created a significant shift in the global economy. Today, exports from China to emerging countries are higher than exports to the U.S. or Europe. “This is the new world, where the old world is largely bypassed,” said Faber. While most of the media debates whether the U.S. will grow, Faber argues it will have little impact on the world, as China has a greater influence now than the U.S.
Faber is no bull on China however, and warned he would be very careful about investing there. Faber sees conditions at the present time as much worse than many people realise. There are also geopolitical concerns that are often left unexamined. On geopolitics, Faber warned that the Middle East is a tinderbox and will go up in flames. “The Middle East, in my opinion, will go up in flames at some point, that will be an unpleasant event,” predicted Faber in his typically apocalyptic but still understated way. Punctuated by his usual dry wit, flashes of humour and dire warnings, it was a sober message and Money Morning Australia report that the attentive audience lapped Faber up. In this webinar, Dr Marc Faber will examine opportunities for investors in the uncertain world of today. This Friday only (April 4th), Dr Faber will give insights into his strategies for protecting and growing wealth in 2014 and beyond. Asian Century? – Western collapse or stagnation? Events in Ukraine – Allocations to precious metals? How to own precious metals? Take profits/ rebalance or buy and hold for long term? Other investment and business opportunities? Please join us for Dr Faber’s webinar this Friday, April 4th, 2014, at 0900 GMT.